The last five years have seen sweeping changes in laws governing social and sexual rights in Malta. In 2011, it was one of the last two countries in the world where divorce was illegal. 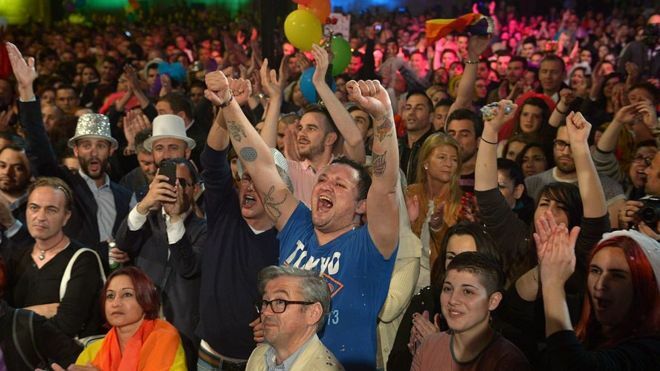 On Tuesday, it became the first European country to ban “gay conversion therapy”, eliciting cheers from LGBT (lesbian, gay, bisexual, transgender) campaigners as well as psychologists. And yet Malta is now the only EU country where abortion is banned outright. Why has so much changed in five years? In 2011, social pressure for change had been building and the “lid was lifted” by a referendum that backed legalising divorce, says Herman Grech of the Times of Malta newspaper. “The referendum changed everything – and the results were pretty surprising for a country where the Church has been dominant,” he told the BBC, and where the centre-right Nationalist party was in power. That process accelerated once the Labour Party came to power in 2013, says Herman Grech. He believes Malta joining the EU in 2004 changed the outlook of its young people. Travelling and studying in Europe “opened their minds”, he says. Malta has one of the highest per capita usages of social media in Europe. And yet Malta’s abortion laws remain among the strictest in the world, don’t they? In Maltese law abortion is banned even in cases where the mother’s life is threatened (though, in practice, there is an exception if the foetus is harmed in the course of essential treatment for the mother, the so-called “double effect” law). For women’s rights campaigner Francesca Fenech Conti, women’s reproductive issues represent one of the last bastions of conservatism in a patriarchal society dominated by the Church. For Mr Grech, abortion remains a “delicate subject – even for those in favour of gay marriage. At the back of our minds we’ve always been told it is murder”. What is the Church’s view of all this? The Catholic Church in Malta is led by Archbishop Charles Scicluna, described by one commentator as “pragmatic rather than fire and brimstone – a bit like Pope Francis”. Will the abortion ban be swept away too? Not if the Church has its way. It has campaigned on issues that it feels could erode the ban – intervening in a recent debate over access to the morning-after contraceptive pill to argue that the pill is itself a form of abortion. But for Ms Conti, Malta will be unable to hold back the tide of change – even in this hitherto taboo area. “There will be changes soon – that we are even having this conversation is evidence. A year and a half ago I couldn’t discuss these issues with my own sister and cousin – now we talk about it all the time. Mr Grech says it depends on whether campaigners can gain popular backing. As before, he says, “if people start speaking up, the parties will follow”.